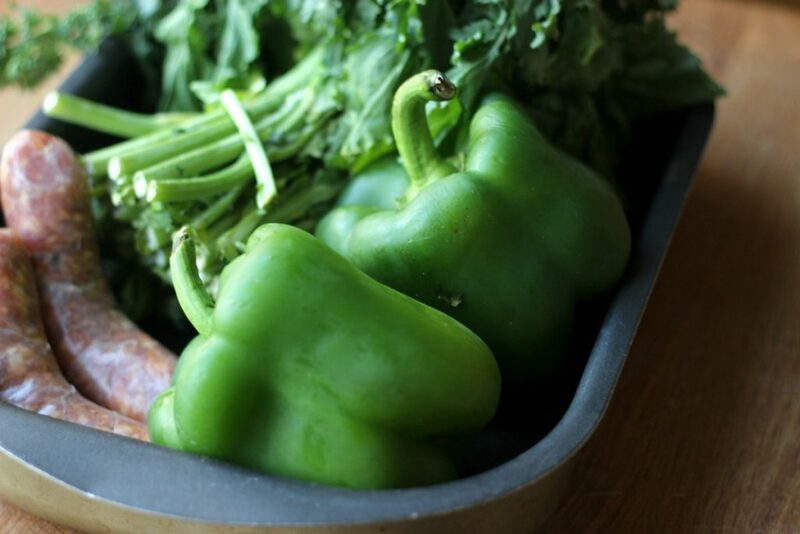 To celebrate our upcoming Sausage Party we thought we would share this recipe for Sausage and Rapini Stuffed Peppers. My mom loves rapini and one of her favourite dishes is sauteed rapini with Italian sausage. This is my take on my mom’s delicious dish using Robbie’s Gourmet Sausage Co’s mild Italian Sausage. Remove the sausages from the casings. Add a tablespoon of olive oil. Add the sausages, breaking them apart as they cook. Once the sausages are cooked through remove them from the pan with a slotted spoon and set aside. Don’t overcook the sausage as they will be spending additional cook time in the oven. Chop off bottom inch of the rapini stalks. Chop the rapini into bite sized pieces. Bring a large pot of salted water to boil and add the rapini. Return to boil and boil for about three to four minutes or until tender but still firm. Drain. Using the same skillet used to cook the sausage, bring to medium high heat and add garlic, pepper flakes and rapini. Cook for 5 minutes. Set aside. In a mixing bowl, combine the rapini, sausages, pecorino and rice and mix thoroughly. Add salt and pepper to taste. Prepare the peppers by removing the tops and seeding them. Add the mixture to each of the peppers filling them. 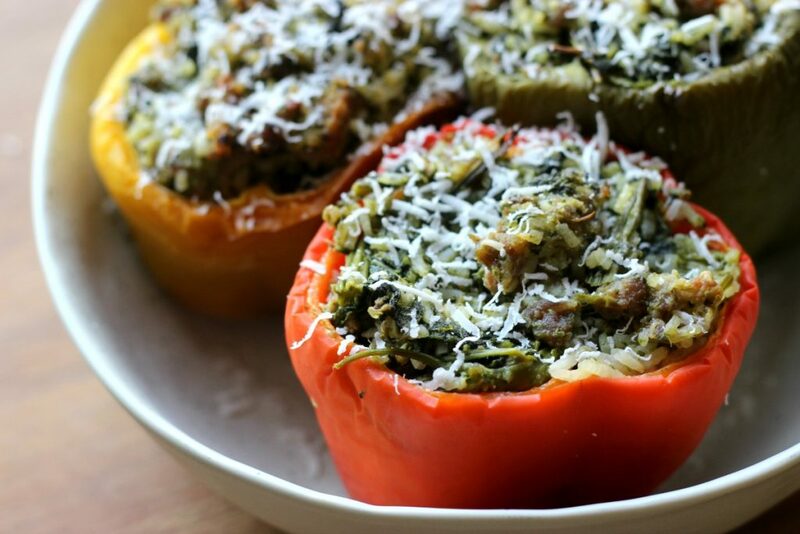 Once you’ve filled the pepper with the rice mixture, place them back into an 8×8 baking dish and into the oven. Cover with aluminum foil. Let them cook for about 45 minutes or until the peppers are tender. Top with a bit of grated pecorino and serve. Stop by our Sausage Party this Friday, September 23, 2016 from 5pm to 11pm at Robbie’s Gourmet Sausage Company. Or join in on our Friday Night Lights free bike ride which is making a stop at the Sausage Party.